Becoming a fully rounded, well trained, competent landscape painter, like all skills, requires learning a craft. For the oil painter, that means mastering several areas of competency. Firstly, the tools – the brushes, paints, mediums, supports etc needed to “construct” the artwork. Secondly, the “academic” or theoretical skills of design, composition, colour and very importantly, art history (so you can place your work in context with the rest of the art world). The third area is the subject material itself – you should know it intimately and have a large set of experiences and techniques to draw on for every element you choose to include in your paintings. 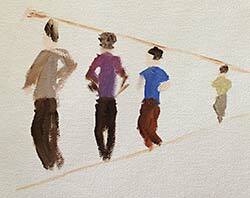 Within each representational landscape painting the artist has to create many different forms. 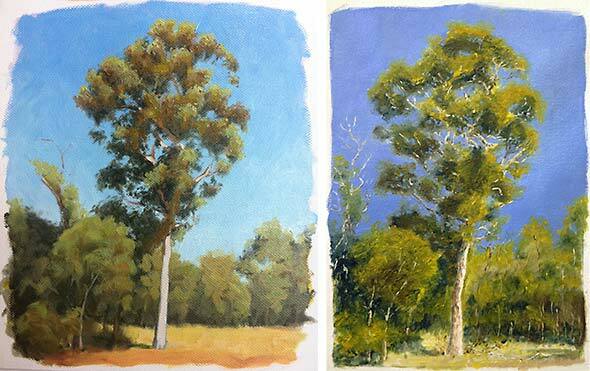 For example, trees, sky, clouds, bushes, roads, buildings, rocks, vehicles, people, fences, livestock, snow, running water, mountains and so on . . . .
On the left is my class demonstration study, which I had brought up to a stage or two from completion. On the right is the student’s version completed at home. What a great sense of authenticity it has. My only criticism was with the values of the sky mass which were too dark and negating the impact of the contrast set up between the highlights and deepest shadows of the tree. However, this exercise was about the tree and there is little to fault there. Each of these are individual elements or “building blocks” that all go together to create a landscape painting. The landscape artist needs to be comfortable with rendering each of the individual elements that they will be placing in their paintings. You need a method or approach you are confident with. The beginning painter will struggle over everything, but after a while they will start to become more confident in some areas as they develop methods that work for them, gained through experience and/or learning. I take this “building blocks” approach to learning with my students. I take typical challenges such as “painting trees” and teach a set of approaches around that which the student can become familiar with and add to their individual set of building blocks. One of my students was struggling with trees, foliage and rendering the form of trees in general. He wanted a sense of reality, rather than the overworked, abstracted patches of green with no discernible light source that he was creating with his limited level of knowledge. Before breaking for the Christmas period, I spent a couple of classes working through these problem areas with him, taking him step by step through techniques that gave him a method of orderly control and the freedom to work within his own developing style. He set off for the Christmas break with an tree study exercise to complete that put it all together for him. Yesterday he brought the result back to me and I was delighted! What a difference from his earlier work. See the pictures above. What else did we work on in class? I took the students through a set of blending exercises that can be used for simple clouds – oh, and someone suggested birds so we had a laugh about the cartoon birds we all drew as kids. Then I amazed everyone by putting some in to my demonstration (see below) and hey presto – such a simple few marks actually work in the landscape painting context. It doesn’t have to be hard to look right. On top of that we reviewed some colour theory and spent an hour practising no-fuss landscape people and scaling them with linear perspective. Funny characters and animated poses appeared from nowhere with just a few brush strokes. That’s my class – all little building blocks of technique to add to the students’ knowledge base.